The Astrobiology Field Laboratory (AFL) (also Mars Astrobiology Field Laboratory or MAFL) was a proposed NASA unmanned spacecraft that would have conducted a robotic search for life on Mars. This proposed mission, which was not funded, would have landed a rover on Mars in 2016 and explore a site for habitat. Examples of such sites are an active or extinct hydrothermal deposit, a dry lake or a specific polar site. Had it been funded, the rover was to be built by NASA's Jet Propulsion Laboratory, based upon the Mars Science Laboratory rover design, it would have carried astrobiology-oriented instruments, and ideally, a core drill. The original plans called for a launch in 2016, however, budgetary constraints caused funding cuts. 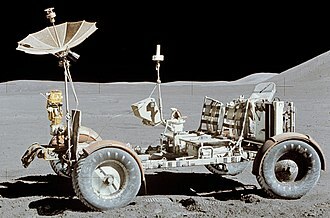 The rover could have been the first mission since the Viking program landers of the 1970s to specifically look for the chemistry associated with life (biosignatures), such as carbon-based compounds along with molecules involving both sulfur and nitrogen. The mission strategy was to search for habitable zones by "following the water" and "finding the carbon." In particular, it was to conduct detailed analysis of geologic environments identified by the 2012 Mars Science Laboratory as being conducive to life on Mars and biosignatures, past and present. 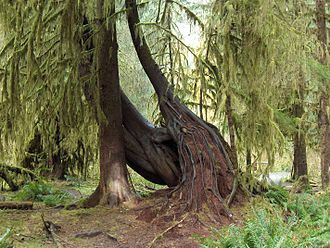 Such environments might include fine-grained sedimentary layers, hot spring mineral deposits, icy layers near the poles, or sites such as gullies where liquid water once flowed or may continue to seep into soils from melting ice packs. 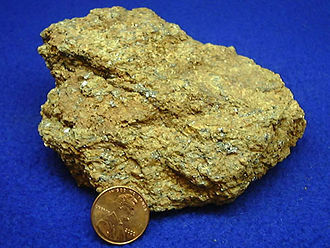 Life processes may produce a range of biosignatures such as lipids, proteins, amino acids, kerogen-like material or characteristic micropores in rock. 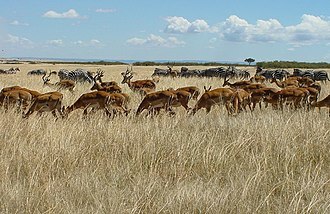 However, the biosignatures themselves may become progressively destroyed by ongoing environmental processes. Sample acquisition will need to be executed in multiple locations and at depths below that point on the Martian surface where oxidation results in chemical alteration. The surface is oxidizing as a consequence of the absence of magnetic field or magnetosphere shielding from harmful space radiation and solar electromagnetic radiation —which may well render the surface sterile down to a depth greater than 7.5 metres (24.6 feet). To get under that potential sterile layer, a core drill design is currently being studied. As with any trade, the inclusion of the drill would come at the mass expense available for other payload elements. Analytical laboratory biosignature measurements require the pre-selection and identification of high-priority samples, which could be subsequently subsampled to maximize detection probability and spatially resolve potential biosignatures for detailed analysis. The conceptual payload included a Precision Sample Handling and Processing System to replace and augment the functionality and capabilities provided by the Sample Acquisition Sample Processing and Handling system that was part of the 2009-configuration of Mars Science Laboratory rover (the system is known as SAM (Sample Analysis at Mars) in 2011-configuration of Mars Science Laboratory). The AFL payload was to attempt to minimize any conflicting positive detection of life by including a suite of instruments that provide at least three mutually confirming analytical laboratory measurements. Precision Sample Handling and Processing System. Forward Planetary Protection for Life-Detection Mission to a Special Region. Pinpoint landing (100–1000 m) (if necessary to reach specific science targets in hazardous regions). Mobility for highly sloped terrain 30° (if required to reach science targets). It was suggested that the Astrobiology Field Laboratory use radioisotope thermoelectric generators (RTGs) as its power source, like the ones to be used on the Mars Science Laboratory. The radioactive RTG power source was to last for about one Martian year, or approximately two Earth years. RTGs can provide reliable, continuous power day and night, and waste heat can be used via pipes to warm systems, freeing electrical power for the operation of the vehicle and instruments. Life utilizes some form of carbon. Life requires an external energy source (sunlight or chemical energy) to survive. Life is packaged in cellular-type compartments (cells). 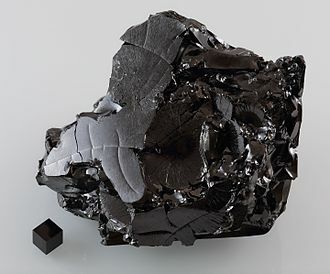 Measuring isotopic, chemical, mineralogical, and structural characteristics of samples, including the distribution and molecular complexity of carbon compounds. Assessing biologically available sources of energy, including chemical, thermal and electromagnetic. Determining the role of water (past or present) in the geological processes at the landing site. Investigate the factors that will affect the preservation of potential signs of life (past or present) This refers to the potential for a particular biosignature to survive and therefore be detected in a particular habitat. Also, post-collection preservation may be required for later sample retrieval, although that would necessitate a further assessment of precision landing of the Mars sample return mission. Investigate the possibility of prebiotic chemistry on Mars, including non-carbon biochemistry. Document any anomalous features that can be hypothesized as possible Martian biosignatures. 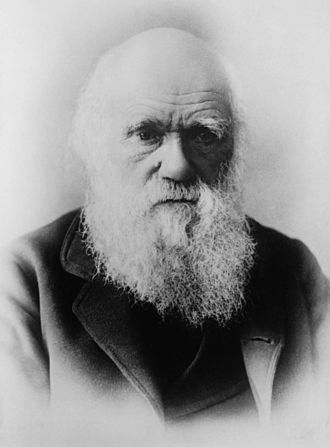 It is fundamental to the AFL concept to understand that organisms and their environment constitute a system, within which any one part can affect the other. If life exists or has existed on Mars, scientific measurements to be considered would focus on understanding those systems that support or supported it. If life never existed while conditions were suitable for life formation, understanding why a Martian genesis never occurred would be a future priority. 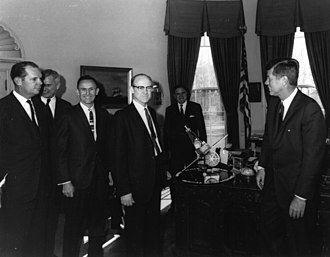 The AFL team stated that it is reasonable to expect that missions like AFL will play a significant role in this process, but unreasonable to expect that they will bring it to a conclusion. ^ a b c d e f g h i Beegle, Luther W.; et al. (August 2007). "A Concept for NASA's Mars 2016 Astrobiology Field Laboratory". Astrobiology. 7 (4): 545–577. Bibcode:2007AsBio...7..545B. doi:10.1089/ast.2007.0153. 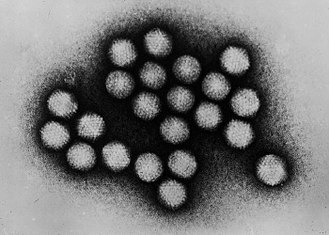 PMID 17723090. Retrieved 2009-07-20. ^ "Missions to Mars". Jet Propulsion Laboratory. NASA. February 18, 2009. Archived from the original on 16 July 2009. Retrieved 2009-07-20. ^ "Mars Astrobiology Field Laboratory and the Search for Signs of Life". Mars Today. September 1, 2007. Archived from the original on December 16, 2012. Retrieved 2009-07-20. ^ Tanja Bosak; Virginia Souza-Egipsy; Frank A. Corsetti; Dianne K. Newman (May 18, 2004). "Micrometer-scale porosity as a biosignature in carbonate crusts". Geology. 32 (9): 781–784. Bibcode:2004Geo....32..781B. doi:10.1130/G20681.1. Retrieved 2011-01-14. ^ Arkani-Hamed, Jafar; Boutin, Daniel (July 20–25, 2003). "Polar Wander of Mars: Evidence from Magnetic Anomalies" (PDF). Sixth International Conference on Mars. Pasadena, California: Dordrecht, D. Reidel Publishing Co. Retrieved 2007-03-02. ^ Dartnell, L.R. et al., "Modelling the surface and subsurface Martian radiation environment: Implications for astrobiology," Geophysical Research Letters 34, L02207, doi:10,1029/2006GL027494, 2007. ^ "Mars Rovers Sharpen Questions About Livable Conditions". 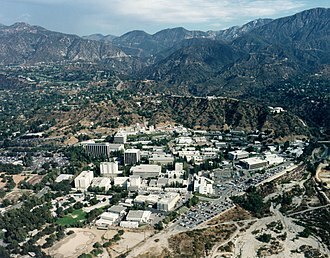 Jet Propulsion Laboratory. NASA. February 15, 2008. Archived from the original on 25 August 2009. Retrieved 2009-07-24. ^ "A Concept for NASA's Mars 2016 Astrobiology Field Laboratory". SpaceRef. September 1, 2007. Retrieved 2009-07-21. 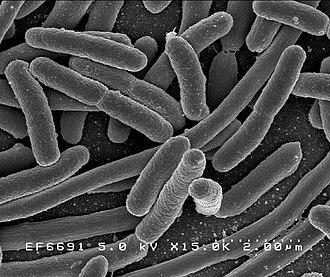 Abiogenesis, biopoiesis, \by-o-po-ee-sis\ or informally, the origin of life, is the natural process by which life arises from non-living matter, such as simple organic compounds. The study of abiogenesis can be geophysical, chemical, or biological, Life itself is dependent upon the specialized chemistry of carbon and water and is largely based upon five different families of chemicals. Carbohydrates are sugars, and as monomer units can be assembled into polymers called polysaccharides, such as cellulose, nitrogenous bases are organic molecules in which the amine group of nitrogen, combined with two hydrogen atoms, plays an important part. 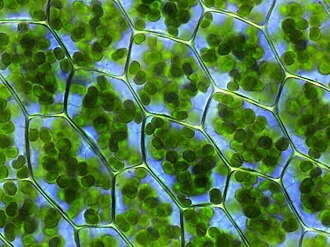 Chlorophyll is based upon a porphyrin ring derived from amine monomer units, nucleic acid monomers are made from a carbohydrate monosaccharide a nitrogenous base and one or more high energy phosphate groups. When joined together they form either the unit of inheritance, the gene, made from DNA or RNA, the monomer unit of a protein is always one of 20 amino acids, comprising an amine group, a hydrocarbon and a carboxylic acid. Through a condensation reaction, in which the acid of one amino acid is linked to the amine of another with removal of a water molecule. 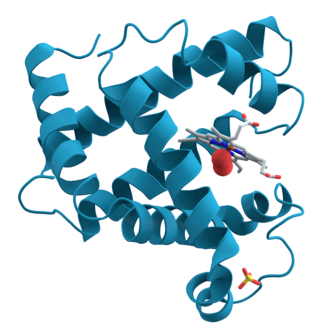 Polymers of amino acids are termed proteins and these molecules provide many catalytic metabolic functions for living processes, any successful theory of abiogenesis must explain the origins and interactions of these five classes of molecules. Many approaches to investigate how self-replicating molecules, or their components. 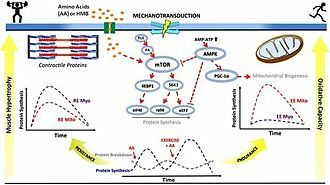 It is generally thought that current life on Earth is descended from an RNA world, various external sources of energy that may have triggered these reactions have been proposed, including lightning and radiation. Other approaches focus on understanding how catalysis in chemical systems on the early Earth might have provided the precursor molecules necessary for self-replication. Complex organic molecules have found in the Solar System and in interstellar space. It is speculated that the biochemistry of life may have begun shortly after the Big Bang,13.8 billion years ago, the panspermia hypothesis proposes that life originated outside the Earth, not how life came to be. The Viking program consisted of a pair of American space probes sent to Mars, Viking 1 and Viking 2. Each spacecraft was composed of two parts, an orbiter designed to photograph the surface of Mars from orbit. 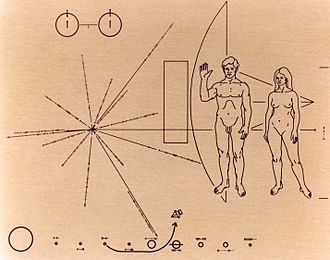 The orbiters served as communication relays for the landers once they touched down, the Viking program grew from NASAs earlier, even more ambitious, Voyager Mars program, which was not related to the successful Voyager deep space probes of the late 1970s. Viking 1 was launched on August 20,1975, and the craft, Viking 2, was launched on September 9,1975. Viking 1 entered Mars orbit on June 19,1976, with Viking 2 following suit on August 7, the Viking 1 lander touched down on the surface of Mars on July 20,1976, and was joined by the Viking 2 lander on September 3. The orbiters continued imaging and performing other operations from orbit while the landers deployed instruments on the surface. The project cost roughly 1 billion USD in 1970s dollars, equivalent to about 11 billion USD in 2016 dollars and it was highly successful and formed most of the body of knowledge about Mars through the late 1990s and early 2000s. Each orbiter, based on the earlier Mariner 9 spacecraft, was an octagon approximately 2.5 m across, the fully fueled orbiter-lander pair had a mass of 3527 kg. After separation and landing, the lander had a mass of about 600 kg, the total launch mass was 2328 kg, of which 1445 kg were propellant and attitude control gas. The eight faces of the structure were 0.4572 m high and were alternately 1.397 and 0.508 m wide. The overall height was 3.29 m from the attachment points on the bottom to the launch vehicle attachment points on top. There were 16 modular compartments,3 on each of the 4 long faces, four solar panel wings extended from the axis of the orbiter, the distance from tip to tip of two oppositely extended solar panels was 9.75 m. The main propulsion unit was mounted above the orbiter bus, propulsion was furnished by a bipropellant liquid-fueled rocket engine which could be gimballed up to 9 degrees. 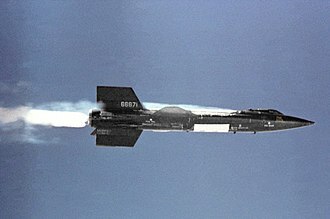 The engine was capable of 1,323 N thrust, translating to a change in velocity of 1480 m/s, attitude control was achieved by 12 small compressed-nitrogen jets. ExoMars is a two-part Martian astrobiology project to search for evidence of life on Mars, a joint mission of the European Space Agency and the Russian space agency Roscosmos. The first part, launched in 2016, placed a trace gas research and communication satellite into Mars orbit and released a stationary experimental lander. The second part is planned to launch in 2020, and to land a rover on the surface, the mission will search for biosignatures of Martian life, past or present, employing several spacecraft elements to be sent to Mars on two launches. The ExoMars Trace Gas Orbiter and a test stationary lander called Schiaparelli were launched on 14 March 2016, the Schiaparelli experimental lander separated from TGO on 16 October and was maneuvered to land in Meridiani Planum. As of 19 October 2016, ESA had not received a signal that the landing was successful, on 21 October 2016, NASA released a Mars Reconnaissance Orbiter image showing what appears to be the lander crash site. The landing was designed to test new key technologies to deliver the 2020 rover mission. The TGO features four instruments and will act as a communications relay satellite. In 2020, a Roscosmos-built lander is to deliver the ESA-built ExoMars Rover to the Martian surface, the rover will include some Roscosmos built instruments. The second mission operations and communications will be led by ALTECs Rover Control Centre in Italy, the ExoMars concept consisted of a large robotic rover being part of ESAs Aurora Programme as a Flagship mission and was approved by the European Space Agency ministers in December 2005. Originally conceived as a rover with a ground station, ExoMars was planned to launch in 2011 aboard a Russian Soyuz Fregat rocket. ExoMars was begun in 2001 as part of the ESA Aurora program for the exploration of Mars. That initial vision called for rover in 2009 and a return mission. Another mission intended to support the Aurora program is a Phobos sample return mission, in December 2005, the different nations composing the ESA gave approval to the Aurora program and to ExoMars. It has attracted sustained study from planetologists and climatologists. 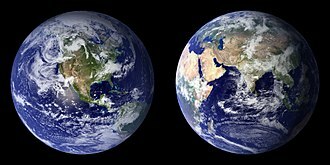 While Marss climate has similarities to Earths, including seasons and periodic ice ages, there are important differences. Mars atmosphere has a height of approximately 11 km, 60% greater than that on Earth. The climate is of relevance to the question of whether life is or was present on the planet. Mars has been studied by Earth-based instruments since as early as the 17th century and orbital spacecraft have provided data from above, while direct measurements of atmospheric conditions have been provided by a number of landers and rovers. Advanced Earth orbital instruments today continue to some useful big picture observations of relatively large weather phenomena. 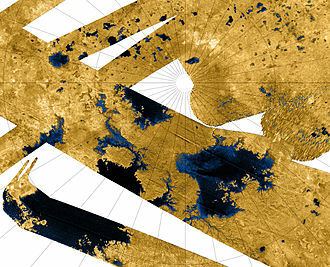 The first Martian flyby mission was Mariner 4 which arrived in 1965 and that quick two-day pass was limited and crude in terms of its contribution to the state of knowledge of Martian climate. 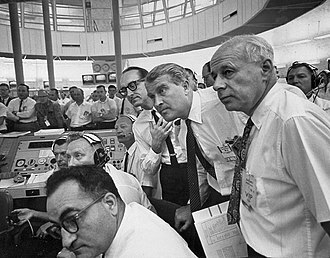 Later Mariner missions filled in some of the gaps in basic climate information, data-based climate studies started in earnest with the Viking program in 1975 and continues with such probes as the Mars Reconnaissance Orbiter. 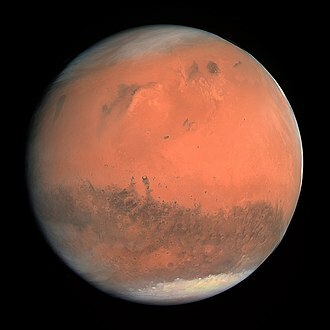 This observational work has been complemented by a type of computer simulation called the Mars general circulation model. 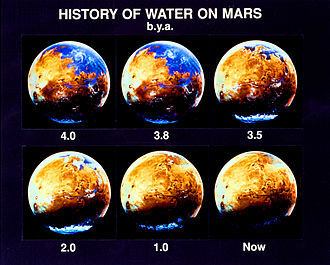 Several different iterations of MGCM have led to an understanding of Mars as well as the limits of such models. Giacomo Maraldi determined in 1704 that the cap is not centered on the rotational pole of Mars. 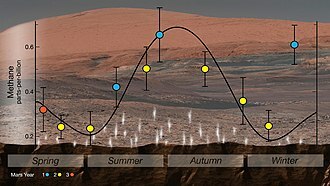 During the opposition of 1719, Maraldi observed both polar caps and temporal variability in their extent, honore Flaugergues 1809 discovery of yellow clouds on the surface of Mars is the first known observation of Martian dust storms. Flaugergues observed in 1813 significant polar ice waning during Martian springtime and his speculation that this meant that Mars was warmer than earth proved inaccurate. There are two dating systems now in use for Martian geological time, one is based on crater density and has three ages, Noachian and Amazonian. The other is a timeline, having three ages, Phyllocian and Siderikian. Recent observations and modeling are producing not only about the present climate and atmospheric conditions on Mars. The possibility of life on Mars is a subject of significant interest to astrobiology due to the planets proximity and similarities to Earth. To date no proof has been found of past or present life on Mars, cumulative evidence is now building that the ancient surface environment of Mars had liquid water and may have been habitable for microorganisms. The existence of habitable conditions does not necessarily indicate the presence of life, scientific searches for evidence of life began in the 19th century, and they continue today via telescopic investigations and landed missions. On November 22,2016, NASA reported finding a large amount of ice in the Utopia Planitia region of Mars. The volume of water detected has been estimated to be equivalent to the volume of water in Lake Superior, Mars is of particular interest for the study of the origins of life because of its similarity to the early Earth. This is especially so since Mars has a climate, and lacks plate tectonics or continental drift. The search for evidence of habitability and organic carbon on the planet Mars is now a primary NASA objective, Mars polar ice caps were discovered in the mid-17th century. In the latter part of the 18th century, William Herschel proved they grow and shrink alternately, in the summer and winter of each hemisphere. By the mid-19th century, astronomers knew that Mars had certain similarities to Earth. They knew that its axial tilt was similar to Earths and these observations led to the increase in speculation that the darker albedo features were water, and brighter ones were land. It was therefore natural to suppose that Mars may be inhabited by some form of life, in 1853, William Whewell, a fellow of Trinity College, who popularized the word scientist, theorized that Mars had seas and possibly life forms. Speculation about life on Mars exploded in the late 19th century, despite this, in 1895, American astronomer Percival Lowell published his book Mars, followed by Mars and its Canals in 1906, proposing that the canals were the work of a long-gone civilization. This idea led British writer H. G. Wells to write The War of the Worlds in 1897, telling of an invasion by aliens from Mars who were fleeing the planets desiccation. The bounds of the CHZ are based on Earths position in the Solar System and the amount of radiant energy it receives from the Sun. Since the concept was first presented in 1953, many stars have been confirmed to possess a CHZ planet, most such planets, being super-Earths or gas giants, are more massive than Earth, because such planets are easier to detect. 11 billion of these may be orbiting Sun-like stars, proxima Centauri b, located about 4.2 light-years from Earth in the constellation of Centaurus, is the nearest known exoplanet, and is orbiting in the habitable zone of its star. The CHZ is of particular interest to the field of habitability of natural satellites. In subsequent decades, the CHZ concept began to be challenged as a criterion for life. Since the discovery of evidence for liquid water, substantial quantities of it are now thought to occur outside the circumstellar habitable zone. Sustained by other sources, such as tidal heating or radioactive decay or pressurized by non-atmospheric means, liquid water may be found even on rogue planets. In addition, other circumstellar zones, where non-water solvents favorable to life based on alternative biochemistries could exist in liquid form at the surface, have been proposed. In the same year, Harlow Shapley wrote Liquid Water Belt, both works stressed the importance of liquid water to life. The theory of habitable zones was further developed in 1964 by Stephen H, at the same time, science-fiction author Isaac Asimov introduced the concept of a circumstellar habitable zone to the general public through his various explorations of space colonization. The term Goldilocks zone emerged in the 1970s, referencing specifically a region around a star whose temperature is just right for water to be present in the liquid phase. In 1993, astronomer James Kasting introduced the term circumstellar habitable zone to refer more precisely to the known as the habitable zone. Whether a body is in the habitable zone of its host star is dependent on the radius of the planets orbit, the mass of the body itself. The geology of Mars is the scientific study of the surface and interior of the planet Mars. It emphasizes the composition, structure and physical processes that shape the planet and it is analogous to the field of terrestrial geology. In planetary science, the geology is used in its broadest sense to mean the study of the solid parts of planets. The term incorporates aspects of geophysics, mineralogy, Mars is a differentiated, terrestrial planet. Most of our current knowledge about the geology of Mars comes from studying landforms, Mars has a number of distinct, large-scale surface features that indicate the types of geological processes that have operated on the planet over time. This section introduces several of the physiographic regions of Mars. Together, these regions illustrate how geologic processes involving volcanism, water, the northern and southern hemispheres of Mars are strikingly different from each other in topography and physiography. 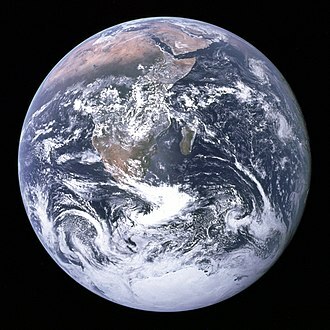 This dichotomy is a fundamental global geologic feature of the planet, simply stated, the northern part of the planet is an enormous topographic depression. About one-third of the surface lies 3–6 km lower in elevation than the southern two-thirds. This is a relief feature on par with the elevation difference between Earth’s continents and ocean basins. The dichotomy is expressed in two other ways, as a difference in impact crater density and crustal thickness between the two hemispheres. The hemisphere south of the boundary is very heavily cratered and ancient. The third distinction between the two hemispheres is in crustal thickness, the location of the dichotomy boundary varies in latitude across Mars and depends on which of the three physical expressions of the dichotomy is being considered. The origin and age of the hemispheric dichotomy are still debated, one endogenic model proposes an early episode of plate tectonics producing a thinner crust in the north, similar to what is occurring at spreading plate boundaries on Earth. Whatever its origin, the Martian dichotomy appears to be extremely old, laser altimeter and radar sounding data from orbiting spacecraft have identified a large number of basin-sized structures previously hidden in visual images. Mars Reconnaissance Orbiter is a multipurpose spacecraft designed to conduct reconnaissance and exploration of Mars from orbit. The US$720 million spacecraft was built by Lockheed Martin under the supervision of the Jet Propulsion Laboratory. The mission is managed by the California Institute of Technology, at the JPL, in La Cañada Flintridge, for the NASA Science Mission Directorate, Washington and it was launched August 12,2005, and attained Martian orbit on March 10,2006. In November 2006, after five months of aerobraking, it entered its science orbit. It paves the way for future spacecraft by monitoring Mars daily weather and surface conditions, studying potential landing sites, MROs telecommunications system will transfer more data back to Earth than all previous interplanetary missions combined, and MRO will serve as a highly capable relay satellite for future missions. 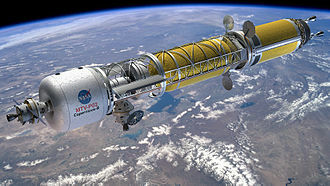 One of two missions considered for the 2003 Mars launch window, the MRO proposal lost against what became known as the Mars Exploration Rovers. The orbiter mission was rescheduled for launch in 2005, and NASA announced its name, Mars Reconnaissance Orbiter. MRO is modeled after NASAs highly successful Mars Global Surveyor to conduct surveillance of Mars from orbit, early specifications of the satellite included a large camera to take high resolution pictures of Mars. Garvin, the Mars exploration program scientist for NASA, proclaimed that MRO would be a microscope in orbit, the satellite was to include a visible-near-infrared spectrograph. On October 3,2001, NASA chose Lockheed Martin as the contractor for the spacecrafts fabrication. By the end of 2001 all of the instruments were selected. There were no major setbacks during MROs construction, and the spacecraft was moved to John F. Kennedy Space Center on May 1,2005 to prepare it for launch, MRO science operations were initially scheduled to last two Earth years, from November 2006 to November 2008. One of the main goals is to map the Martian landscape with its high-resolution cameras in order to choose landing sites for future surface missions. Three different Mars rover designs; Sojourner, MER and Curiosity. Carl Sagan with a model of a Viking lander. Artist's concept depicting a Viking lander on the surface of Mars. Artist's impression of the Phoenix spacecraft as it lands on Mars. A labeled look at NASA's Phoenix Mars lander. A comparison of sizes for the Sojourner rover, the Mars Exploration Rovers, the Phoenix lander and the Mars Science Laboratory. Mars Orbital Laser Altimeter (MOLA) colorized shaded-relief maps showing elevations in the western and eastern hemispheres of Mars. (Left): The western hemisphere is dominated by the Tharsis region (red and brown). Tall volcanoes appear white. Valles Marineris (blue) is the long gash-like feature to the right. (Right): Eastern hemisphere shows the cratered highlands (yellow to red) with the Hellas basin (deep blue/purple) at lower left. The Elysium province is at the upper right edge. Areas north of the dichotomy boundary appear as shades of blue on both maps. Viking Orbiter 1 view image of Valles Marineris. Mars Orbital Laser Altimeter (MOLA) derived image of Planum Boreum. Vertical exaggeration is extreme. Note that residual ice cap is only the thin veneer (shown in white) on top of the plateau. 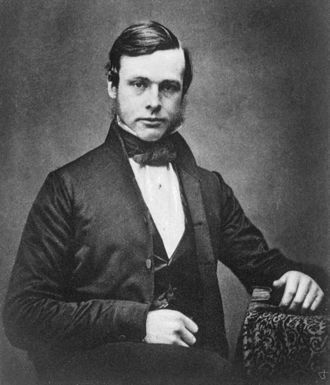 Joseph Lister was a pioneer of antiseptic surgery. Precambrian stromatolites in the Siyeh Formation, Glacier National Park. 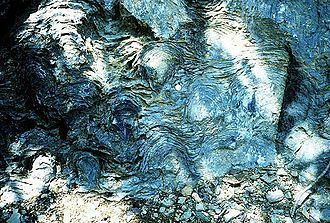 In 2002, a paper in the scientific journal Nature suggested that these 3.5 Ga (billion years) old geological formations contain fossilized cyanobacteria microbes. This suggests they are evidence of one of the earliest life forms on Earth. Carl Sagan speculated that alien life might use ammonia, hydrocarbons or hydrogen fluoride instead of water. The first close-up images taken of Mars in 1965 from Mariner 4 show an area about 330 km across by 1200 km from limb to bottom of frame. Mariner Crater, as seen by Mariner 4. The location is Phaethontis quadrangle. Planet Mars – most abundant gases – (Curiosity rover, Sample Analysis at Mars device, October 2012). Understanding planetary habitability is partly an extrapolation of the conditions on Earth, as this is the only planet known to support life. The moons of some gas giants could potentially be habitable. 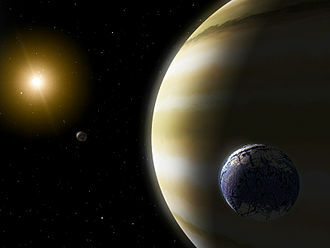 An artist's impression of GJ 667 Cc, a potentially habitable planet orbiting a red dwarf constituent in a trinary star system. 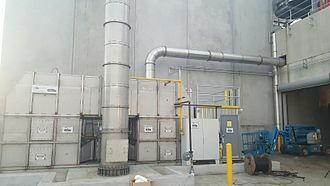 Thermal oxidizers can use a regenerative process for waste heat from industrial systems. 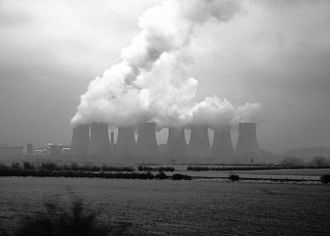 Cooling towers evaporating water at Ratcliffe-on-Soar Power Station, United Kingdom. A color chart of some raw forms of commercially valuable metals. 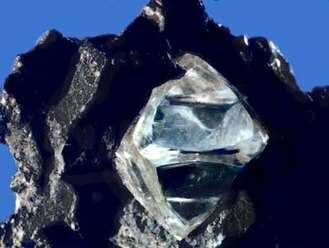 Mineralogy is a mixture of chemistry, materials science, physics and geology. Oriented Core Goniometer commonly used when logging core and analyzing contacts and other structural features.